The motto for the latest public service announcement on drunk driving is: “Drinking and driving. It’s no game.” Common sense dictates that this statement is true. Unfortunately, a lot of people don’t seem to use common sense when it comes to drinking and driving, and they do treat it as some sort of game. Anyone whose life has been affected by drunk driving can tell you it’s far from being a game. The statistics bear witness to this fact. It is unfair thal lives are changed forever or destroyed by someone who got behind the wheel of a car while under the influence of alcohol. Other people should not have to pay for this sort of blatant disregard for responsibility or the law. Driving under the influence of alcohol is againsl the law, could cost you your license, and buy you a jail term. If that is not enough of an inducement to get people not to drive under the influence, maybe knowing what they can do to themselves and othiers will. Being behind the wheel of a car while intoxicated tums that car into a lethal weapon, a weapon with the power to maim or destroy the lives in its path. If people want to be irresponsible and gamble with their own lives, that is their affair. But they should do it when they are not in danger of hurting others. There is nothing wrong in having a drink as long as we do the responsible thing and not drive under the influence. If we are not going to think about the harm we can do to ourselves we should at least have the common decency to be considerate of the people we can injure or kill. 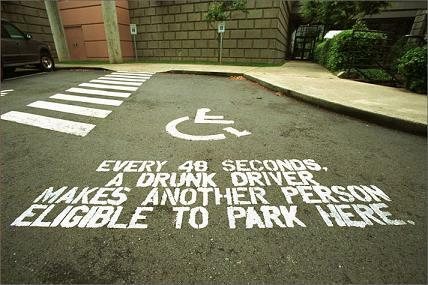 Consider the high cost of drinking and driving. Is it worth the risk? I think not.